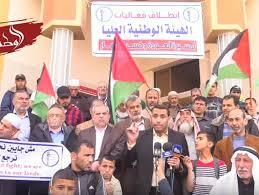 Gaza, ALRAY - The National Committee for the March of Return and lifting the siege issued a statement denouncing the US administration recent decision to cut UNRWA funds. The statement explained that the United Nations Relief and Work Agency for Palestinian Refugees “UNRWA” at the end of its seventh decade, is the only witness to the tragedy of Palestinian refugees. Its establishment as a United Nations agency, by resolution of the general assembly of 8 December 1949, helped to keep the refugees issue alive until a just & lasting solution is found. The recent announcement of Trump’s administration to cut all US funding for UNRWA will have devastating impacts on more than five million Palestinian refugees who rely on UNRWA schools, healthcare, and social services. The reduction of UNRWA services means depriving more than 5.4 million Palestinian refugees of basic services such as education and healthcare. It also means causing a closure of 702 UNRWA schools, depriving more than 500,000 refugee students of access to education and the collective layoff of some 30,000 of the Agency’s staff members, furthering the precarious humanitarian and social situation. This serious decision, the threats to end UNRWA, and the decline of UNRWA services will lead to catastrophic results. It will definitely lead to further destabilization in the region, yet will make the Palestinian refugees more insistent on the right of return. The current march of return and the regular protests along the separation fence separating Gaza Strip from occupied Palestine will only be a small step leading to a further escalation which will inevitably take place when the refugees are thrown into an abyss of hopelessness and despair. We are calling the international community to interfere immediately, to support UNRWA and the Palestinian refugees and we will continue in our legal & legitimate struggle to achieve our rights.